While white sapphires are appealing to some, we recommend considering a diamond for beautiful jewellery that can be worn every day and will last for years. We suggest purchasing a diamond from a reputable and reliable jeweller. A white sapphire is a colorless sapphire. While normally thought of as a blue gemstone, sapphires naturally occur in a variety of colors, including yellow, green, pink and white. As a part of the corundum family of minerals, sapphires are a type of aluminium oxide containing traces of titanium, iron, magnesium, copper and chromium. The minerals present in the stone's composition help designate its color. Often used as a diamond substitute, white sapphire is a colorless stone that is generally much cheaper than a diamond. In most cases, white sapphires are yellow or grey stones that are heat treated or chemically treated, meaning they undergo a specific process to achieve their clear color. Natural white sapphires do exist but are incredibly rare. Most natural sapphires are found in Southeast Asia, Africa, the Middle East and western parts of the United States. Though clear in color, white sapphires usually exhibit a cloudy white hue, providing one way to identify them in comparison to diamonds, topaz and moissanite. Measuring 9 on the Mohs scale of hardness, sapphires are quite durable enough for everyday wear. A diamond is evaluated based on its 4Cs (cut, color, clarity and carat). A white sapphire is evaluated differently. The GIA, for example, does not grade white sapphires they only provide a report with basic details like color, carat weight and treatment. The 4Cs are still important components to consider, but other characteristics, such as color tone, purity and level of saturation must be assessed as well. When it comes to colored gemstones, a range of cutting styles exist. Details and grading scales for each style of cutting, for each colored gemstone would be a large and unfruitful undertaking for any lab entity. Up to this point, laboratory grading systems have not found a need to have standard cut gradings for most colored gemstones. • Look for a white sapphire without a "window." A window means the back of the stone can be seen through the table. When a window is present in a white sapphire, it indicates the stone has no light reflection or color. • Review symmetry grade: assess the stone's proportions and balance, including its length to width ratio. • Assess for balance: is the culet off center? Is the girdle uneven? • Check table size: Look for a white sapphire with a table size between 33-67%, meaning the table is not too small or too large for light to adequately pass through. • Watch for brilliance. Does light reflect and sparkle off the sapphire? Or is the stone dull? The hue of a colored gemstone is the most critical element when it comes to choosing a stone. With white sapphire, the purer its colorlessness the better. Brilliance and fire matter less in white sapphires than they do in diamonds (and offer much less brilliance and fire than diamonds as well). Judging a sapphire's color should come down to what you see with the naked eye, and how the stone appeals to you. You'll want to watch specifically for color zoning. If the color is consistent throughout, then it is a more valuable stone. A white sapphire with uneven coloring is generally less appealing. Many white sapphires are color treated, causing them to be less expensive than naturally occurring white sapphires. The stone may be heat treated or chemically treated, depending on the stone's composition and the desired effect. Colored gemstones tend to have more inclusions and blemishes than diamonds, but most are noticed only under 10x magnification. To evaluate a white sapphire's clarity, review the stone closely with your own eye to determine if any blemishes or inclusions are visible and if they take away from the stone's overall beauty. Carat refers to the weight of the sapphire, not the size. A 1 carat sapphire equals 200 milligrams, or 0.2 grams. Depending on the sapphire's shape and how its cut, two 1 carat sapphires could be quite different in size. Carat weight must be considered, but the overall beauty of the sapphire should carry more importance. While at first glance, a diamond and a white sapphire might look similar as two colorless gemstones, but there are some significant differences. First, and most importantly, diamonds offer much more brilliance and fire than a white sapphire. 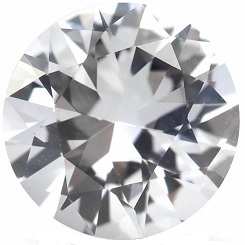 When it comes to refracting light, diamonds are the superior choice. If you were to place a high quality diamond next to a high quality sapphire, you could easily tell the difference. A diamond will reflect both white and colored light, making it sparkle and catch your eye, while the white sapphire will seem dull and lifeless. Second, diamonds rank a 10 on the Mohs scale of hardness. They are nearly 100% scratch resistant and rarely ever need re-polishing. On the other hand, sapphires rank a 9 on the Mohs scale, which means they are durable, but not scratch resistant. Third, over time, a sapphire (especially one that is worn daily) will acquire a buildup of dirt, soap and potentially even scratches. The sparkle and attraction of the sapphire do not bode well for daily use like they do for a diamond. Another difference between a white sapphire and a diamond is found in the price. If you're not as concerned with the brilliance and beauty of the stone, but care more about the size or having an untraditional gemstone, a white sapphire could make sense for you. When looking for a white sapphire engagement ring or any engagement ring for that matter one of the first choices to decide on is the shape. The shape refers to the formation of the gemstone, whether that's oval, pear, cushion cut or something else. The shape of a gemstone is primarily chosen based on personal preference. If you're looking for a classic stone, you may opt for a round cut or princess cut. If you're desiring something more unique, consider a pear or heart shaped sapphire. The cost and beauty of these stones differ, so it's best to consider a few shapes before deciding which one is right for your engagement ring. Like diamonds, white sapphires can be set in any type of metal: white gold, yellow gold, rose gold or platinum. Consider which metal will be best for you, keeping in mind the style of the person who will be wearing the ring. Your white sapphire should look colorless in relation to its setting. In addition to the metal, you'll need to choose the style of setting for the engagement ring. Although personal preference plays a large role in deciding on setting style, a halo setting with smaller stones surrounding your center stone or a pave setting with stones embedded into the band are quite popular. Naturally occurring white sapphires of high quality are quite rare, and their prices reflect such rarity. Heat treated sapphires are not nearly as rare and can be purchased for a reasonable price. Higher carat white sapphires, like 3-4 carat stones, are much rarer, and that continues as carat weight increases. Prices reflect that rarity but still tend to be less than diamonds. If you're looking for a white sapphire engagement ring or other piece of jewellery, we suggest purchasing from a reputable jeweller. If you're looking for a stunning engagement ring that will maintain its beauty and value over the long term, we highly recommend considering a diamond ring.